The house was a three-bedroom with a square backyard, one short flight of stairs descending to the basement and a second leading to the upper floor. The living room was drafty, so she caulked along the window frames. The garage had mice, so he bought traps—the ones with the sticky paper that resulted in a slower death for the struggling rodents, but which spared him the sight of any blood. They performed these tasks with cheerful efficiency. They were goal-oriented people. “Thing-doers,” she liked to say at those first, early parties where they were the only married couple, where they spoke in triumphant first-person plurals about their home improvement projects. They were people who got things done. He was the first one to notice the extra step, stumbling over it on his way to the kitchen one morning. His feet recognized it before his brain. He had to go back and count: four, five, six. He wondered if he was losing his mind. The past month had been stressful. Their sickly newborn had spent the first week of its life inside a lighted box at the hospital like a rare museum artifact. Then it came home, it became a he, a living creature to dote on and fret over and sometimes secretly despise as they rushed to and from his crib, dead-eyed with exhaustion. But the staircase to the second floor continued to grow. Up to eleven steps by the time his mother visited and informed them that they did not have the baby on a schedule—the baby had them on a schedule. 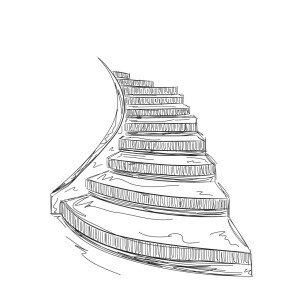 She didn’t mention the elongated staircase, though his wife had embraced the anomaly with enthusiasm, marching up and down the steps with a five-pound weight in either hand, determined to return to pre-baby shape in record time. Over the years they called in experts. Carpenters, architects, structural engineers. A clairvoyant wanted to feature them on her TV show, certain they were hosting a spirit who reached out with ghostly fingers to manipulate the steps. They stopped having friends over. It was embarrassing, trying to explain. They wanted to sell the place, but who on earth would take a house with 43 stairs? The people at her office complained when the elevator shut down, and that was only two flights. They resolved to ignore it. It was the same strategy they offered their son when his little sister parroted his phrases. Just ignore her. She’ll get bored and go away. For a while it worked. The stairs seemed to max out. She returned to school, working toward her MBA on the company’s dime. He went part-time and learned to cook like Ina Garten—gazpacho and shrimp scampi, coconut cake on gleaming metal stands. Weekends, they rented movies, avoiding Netflix because they distrusted this growing culture of instant gratification, but also because they liked the sight of their children galloping pink-cheeked between the racks of DVDs. Then his father died. It took something out of him. He became fussy and fearful. He obsessed over their children’s diets. On evenings she had class, she worried he wasn’t feeding them enough. She took to sneaking junk food into their backpacks. Her daughter gobbled these treats on the bus ride home each day, tonguing the traitorous cheese dust from beneath her fingernails. The packages in her son’s bag always returned unopened, yet in an act of some great cosmic injustice, he remained overweight. The staircase began to grow again. Three, sometimes four steps a night. It curled in tight spirals. He thought of a nautilus; she, the twisted ladders of DNA. Their daughter was fond of the stairs. She had a name for each one. They could hear her greeting them as she ascended to her bedroom—“Hi Mitsy, hi Scooter, hi Phil—” her voice fading into the heights, then silenced. For their son, the stairs were the torment of gym class all over again. He begged to sleep in the first-floor study. His father worried about all the things a boy could get into. His wife told him to stop hovering and hired a team of baffled movers to maneuver her son’s bed down the 97 steps. In the past year, she’d begun sleeping with the woman who delivered the mail. “For the free stamps,” she told her husband when asked why she’d done it. She had expected the telling to ignite something between them. Instead it only sat there like a sidestepped piece of roadkill, awaiting pick-up from the people who were paid to do that sort of thing. They were forced to take rest stops on the journey to the second floor. Their bodies had started to protest the climb: her hips, his feet. At the midpoint, they could hear neither the stutter of video game gunfire from their son’s first-floor bedroom, nor the shrieked Japanese of their daughter’s Anime shows upstairs. There was only the house—an orchestra of shudders—and their own frail voices as they pitched ideas, the same ones every night. They could install an elevator. They could move, permanently, downstairs. They could take the financial blow and abandon the house. But by the time they reached the second floor, aching and sweaty, it was all they could do to collapse into bed. Lighting bolts cut through his dreams. She saw an endless snake of roller coaster tracks, writhing through a fiery sky. When the scene morphed and they found themselves teetering at the top of the stairs, it was not always clear whether they were dreaming or not—for if it was a dream, it was so lifelike that when she sprang over the railings and began to free fall, when he dove headfirst from the topmost step, there was the perfect crystallized panic, followed by the gut-swooping relief, of having relinquished oneself to an irrevocable mistake. Tessa Yang is an MFA candidate at Indiana University where she serves as the Associate Editor of Indiana Review. Her fiction has appeared or is forthcoming in Clockhouse, The Writing Disorder, and Lunch Ticket. Her short story “Runners” was a finalist for The Cossack Review’s October Prize and will appear in Issue 7. When not reading and writing, Tessa enjoys playing Frisbee and counting down the remaining days until next year’s Shark Week. Follow her on Twitter: @ThePtessadactyl.